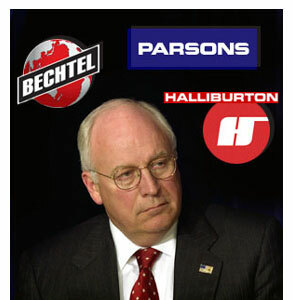 You are currently browsing the category archive for the ‘Bechtel’ category. Republicans have a really odd vision of history. This just in from a Far Right Evangelical website which I will not name out of respect for those here who wish not be linked to the more extreme elements of their sect……(But with a little research, I am sure anyone can locate the source….).. Disclaimers aside, this sect, out in the Midwest was praising Bush/Cheney and the nuclear weapons on their way to Iran… Here is their amazing logic……. In the 30’s the dust bowls ripped all the topsoil away. Extreme drought and extreme temperatures preceded the dust storms. This summer extreme temperatures and extreme drought dominate the Midwest. It was only World War II that pulled us out of the Great Depression some 10 years later. Their claim was that if Bush held strongly to his beliefs, and did not waiver and back down from nuking Iran, WWIII would begin and the rains would come.